hulk, originally uploaded by jahansell. It was dry today, for the first time in what feels like weeks. Cold, but sunny. Spring is in the air. 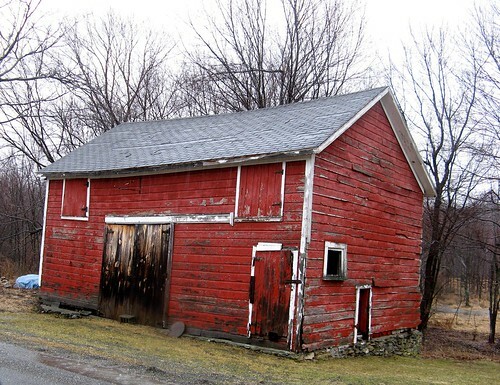 This barn is on East Ancram Road, all boarded up and dead-looking. This is a charming farm. I love its New England color. This is beautiful. I like the title you chose too. The color could be also from Seden or Finland, a very special red. It does look like it has seen much better days and it was once fondled over and painted up. Now, sad, wet, cold and miserable-looking.